Grinders (UŞM), Popularly known as Bulgarians, They are popular and reliable tool. But still when something breaks. To repair their own hands grinders easy, if before you guide, telling step by step procedure for repairs LBM. Below you will find answers to any questions about gear repairs, rotor, stator, Carbon brushes angle grinders. Angle grinders in the home environment, the masters are very popular. Possibility of turnover of working bodies allows cutting, grinding, polishing operations. The presence of soft starter makes the tool work safe and convenient. 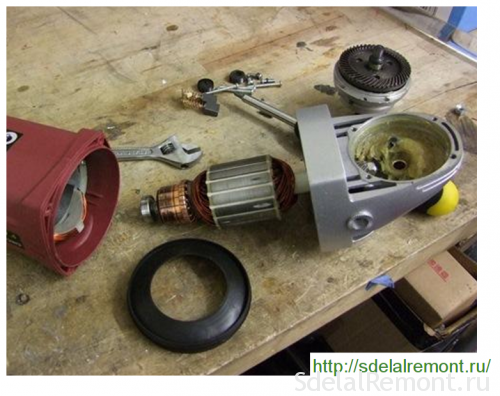 Repair angle grinder simple and can be performed independently. For those, who dare to carry out repairs on their own angle grinders, Angle scheme will need the correct type machines, tool, lubricants and this instruction. Any repairs to grinders with their hands begins with the study of emerging faults. The device is simple enough grinders. The rotating rotor through helical gear transmits torque to the shaft (spindle) working body. Spindle set the desired working tool, whether it's cutting stone, Grinding or polishing wheel and holds the desired process step. by the way, about the shape of the tooth. At low power grinder mounted spur gear. Helical gears are used in the grinder with a capacity of more than 1000 W.
Angle cars, like any tool break down over time,. 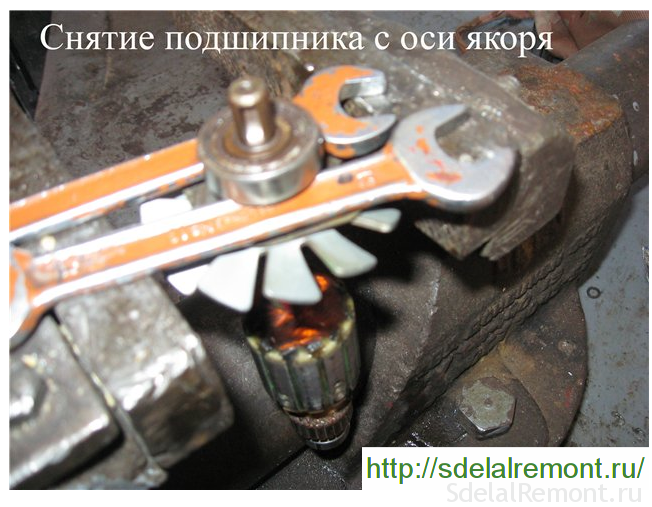 The reasons for the Bulgarian faults can be different. They appear not only on the tool misuse, but also delayed the replacement of carbon brushes, lubricating fluids. Regardless of the model of the angle grinder fault at all appear in the same nodes. bolgarok Faults are divided into mechanical and electrical. For beginners repairmen faults are divided into simple and complex. Bulgarian - this angle grinder, designed to perform cutting, grinding, polishing work. Bulgarian in the process is subjected to heavy loads, It is working in a dusty environment. Excessive load when using grinders in "Cutting" mode causes increased wear of the bearing is not only, but the teeth of gear reducer. The main fault of the mechanical part of the Bulgarian, deterioration or destruction of the sliding bearing shaft helical gear large gear. Troubleshoot grinders easy, if the hand is its circuit, description and recommendations for repair works. 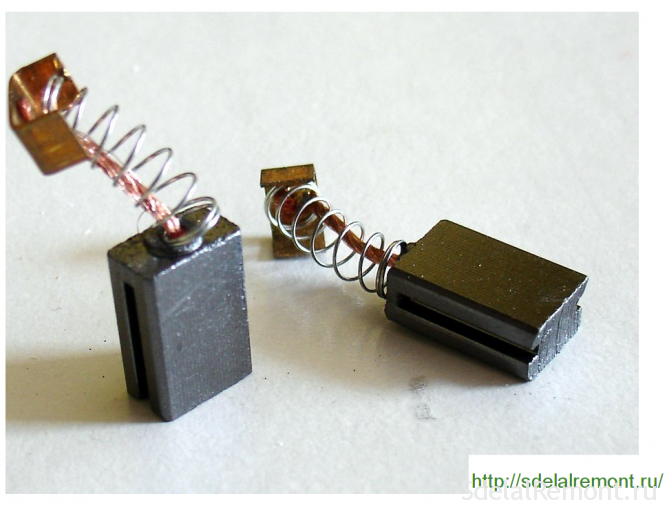 untimely replacement or destruction of carbon brushes. The design of all Bulgarians provides fast and does not constitute any difficulty replacement bearing. 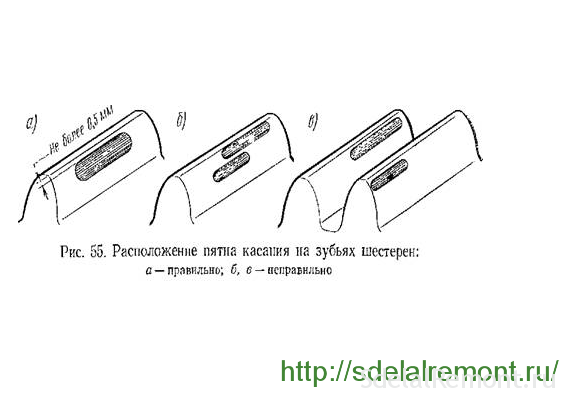 faults Bulgarian, associated with deterioration or destruction of the sliding bearing shaft end characterized by the appearance of unpleasant stray sound. Destruction of the sliding bearing shaft clearance test detected the tool installation. Determined by swinging in opposite sides of the shaft when installing the tool. At the next check installation of the tool shaft Backlash, shaking his end in different directions. Backlash should be absent or minimal. The emergence of backlash indicates the need for replacement of the slide bearing. 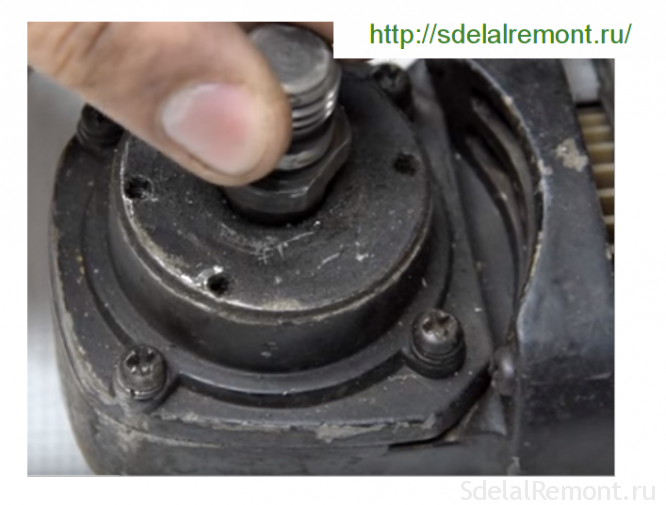 Repair bearing is to remove it from the housing and remove the shaft gear. Remove the bearing from the shaft by means of a stripper better. The inner race of the bearing destroyed is best to get in using tap the desired diameter, pre-screwed in the holder. 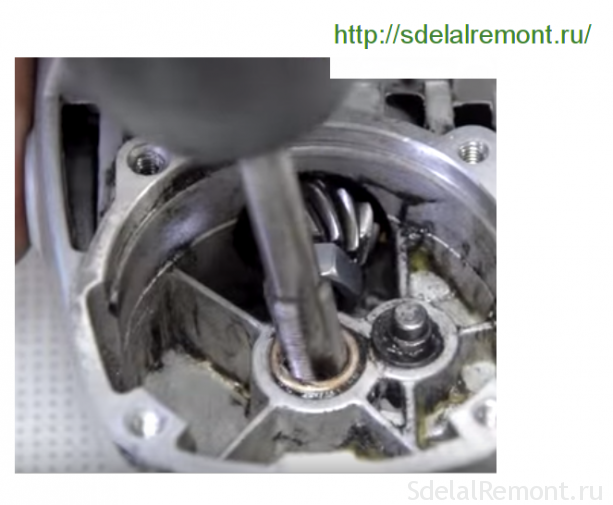 With the rotor bearings are removed by using a stripper or popular method. The keys are inserted vise or metal strip, bearings fit on the keys and using nastavki soft metal and a hammer weight of at least 400 g threshed from the shaft axis. The degree of wear of the pinion gear grinder checked for contact patch. Pre-reducer is completely cleaned of old grease. At low gear reducer applied special bluing, rotates the gear unit. Then it is necessary to remove the large helical gear driven and look through a magnifying glass at the contact patch. It should occupy a total of not less than 50% tooth surface. Otherwise gear needs to be replaced or corrected tooth profile. Correction of tooth profile repeatedly described in the pages of this website. But this problem has been solved only experienced masterom.Chasche all slicked, Cut or damaged gear changes fully, and paired. When repairing any gear grinders most difficult task is to remove the gears and bearing Pulling out. 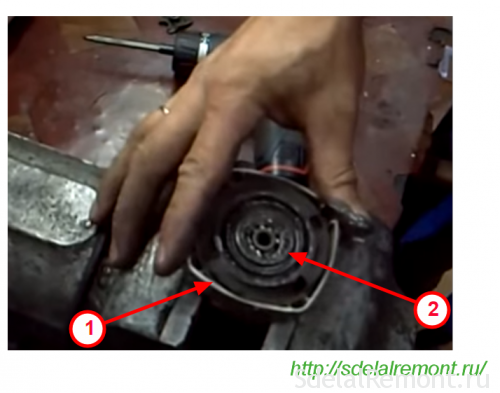 Dismantling the gearbox begins with the removal of the cover gear position 1 and disconnecting the stator housing and the rotor release pos.2. Freed rotor is clamped in a vice and twisting the nut pos.3 driving pinion. The cover is molded gear spindle bearing. To get a bearing, in some grinders, remove the retaining ring, fixing the support bearing, and remove the bearing. Destroyed bearing position 1 in the gear housing pos.2 easiest to get , by prying with a screwdriver. In other models gear spindle fixes the retaining ring. The pinion is pressed onto the spindle. Leading small gear or a shaft is screwed on the thread left (some models Sparky, right-handed thread), fixed or keyed and clamped by a nut. As a grinder to 1000 W applied spur gears, angle grinding and typewriters used helical gears. Gears are mounted in a variety of different Bulgarian. The pinion gear is mounted on the rotor shaft keyed or mounted threadedly. The driven gear is mounted on the spindle shaft by interference fit or by means of key connection. 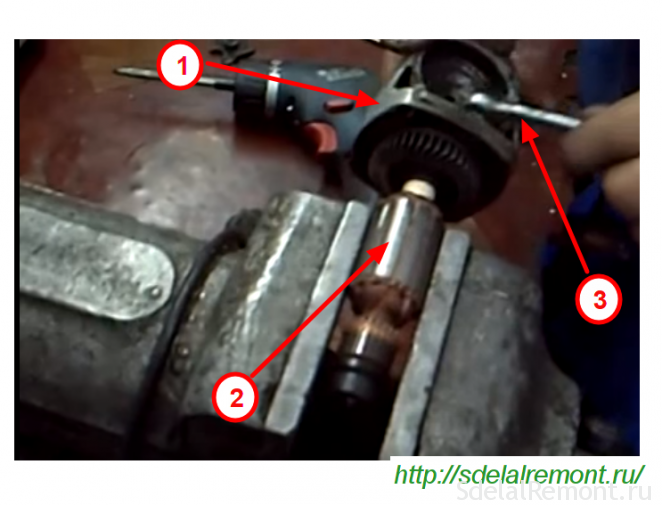 Learn more about removing gears and bearings with shaft. Repair of gears is to replace them, and only in a pair. Continuous and smooth operation depends on the presence reducer a sufficient amount of lubricant and its timely replacement. Spindle lock button is designed for rapid removal of the working instrumenta.Knopka breaks when pressed at the time of rotation of the disk. Repairs grinders is a complete replacement of a button. Button should be pressed only in a state of stopping the grinder. Schematic diagram of the main part substantially identical bolgarok. Rotor transmits torque through a gearbox to the working tool. The rotor rotates in the stator field. the control circuit consists of a button, regulating speed and performing soft-start tool, carbon brushes, ensuring the transfer of AC voltage to the commutator bars. Power to the instrument is supplied through the connecting cable. delamination or development lamella collector. 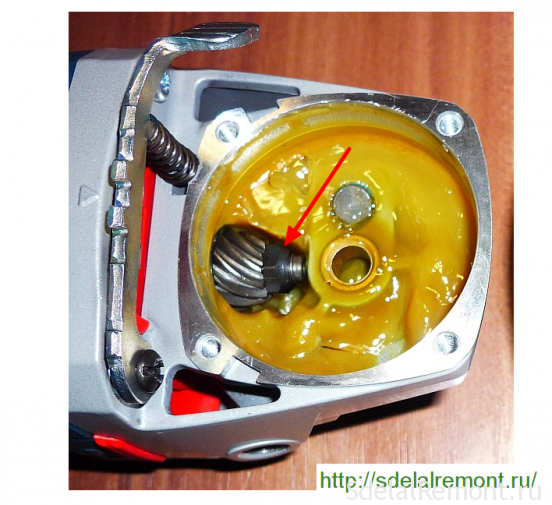 Bulgarian malfunction of the electrical part is best determined tester or other device. Suitable for this improvised device and tselee, called the people "Arkaška". 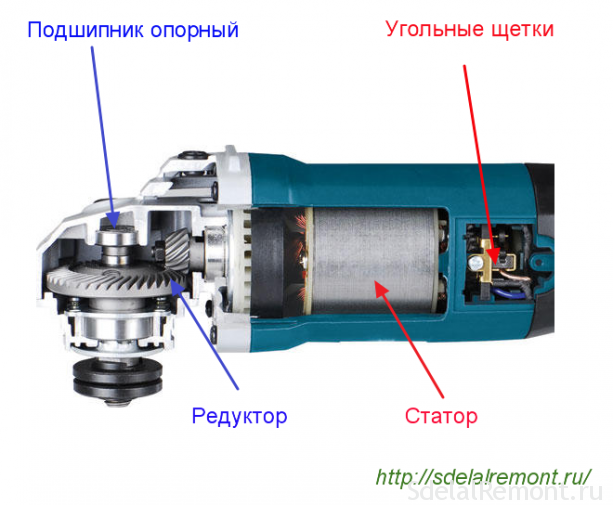 Driving grinder is simple and requires no special knowledge. It is only necessary to use caution and safety when carrying out repair work and know the amount of electrical engineering in high school. One common breakages becomes impossible grinder incorporating a tool or stalling during operation. The cause of the fault of this kind becomes a power cable break at the entry site poz.27. Troubleshoot replacement of the cable or by removing the failed portion. Fault can be found easily using a tester. If there is a tester at hand, but there is a screwdriver with neon indicator light, the fault can be found, serially connecting the power cable to the phase. Reliable operation of any power heavily depends on the integrity and proper operation of the carbon brushes. The qualitative fit of the carbon brushes, their correct position relative to the commutator bars affects the efficiency of the rotor collector. Remember! Length electro coal can not be smaller than 8 mm. Timely replacement of carbon brushes to avoid most of the faults. The degree of wear of carbon brushes is characterized by species at the site sparking collector. Arcing must be uniform across the contact area of ​​the carbon brush and the slat length, and not exceed a 8 mm. Circular sparking talks about a fault in the rotor circuit. The grinder is recommended only carbon brush tool manufacturers. Homemade carbon brushes You can install, but only for a short period and immediately replaced at the earliest opportunity. Faults power button is most often manifested in a difficult and precarious the instrument is turned at start. This fault appears and disappears spontaneously. It is unacceptable to operate grinder with a faulty power button. This fault leads to jamming cutting discs during operation, and their destruction with unpredictable consequences. The fault persists complete replacement of the buttons on the new. 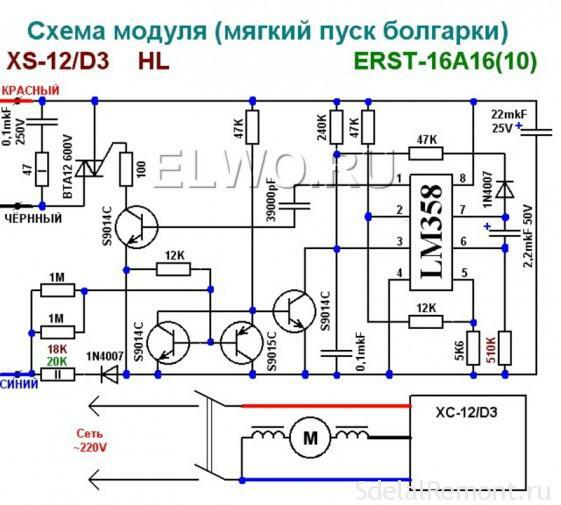 In modern models of Bulgarians integrated soft starter with speed regulator. Repair it is not subject, and require complete replacement. Not, advanced master left-handed, of course, and be able to repair this unit. On the failure of the stator indicates spontaneous promotion machine shaft, Bulgarian begins to gain maximum speed. This fault indicates the emergence of inter-track circuit in the stator winding. Some problems can be eliminated only by specialists. Extension of the smooth operation of the stator can only be timely cleaning, greasing and replacing the carbon brushes and bearings. Typically, the stator crashes are rare. To this causes frequent overheating of the tool during operation. A problem occurs only strong heating grinder body and the appearance of the smell of burning insulation. The stator may be either open, and short-circuit. examining the stator not, failure data can be easily found using the IR-32 device. Problems can be solved by replacing the stator. For lovers of tinkering with his own hands can recommend rewind the failed stator own hands. Nothing complicated about it. 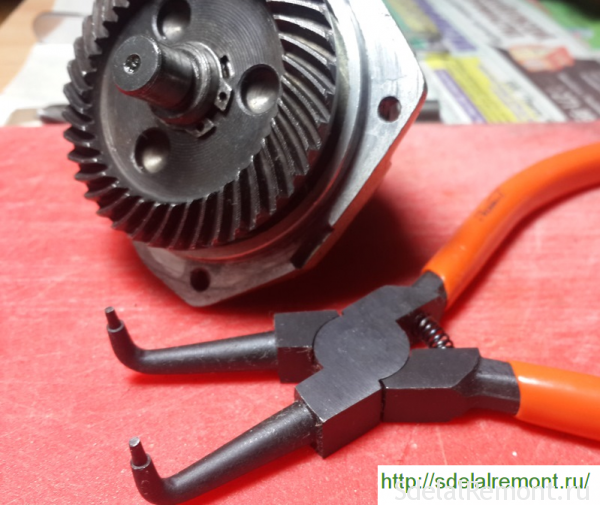 Stator easily removed, but in different models of angle grinders in its own way. remove the stator housing by tapping on a wooden mallet or a bar. Yield rotor failure caused by a grinder tool misuse, frequent overheating, untimely replacement of the carbon brushes, hit into lamellas collector abrasive particles and dust. First increases the length of the sparks on the collector, then there is the smell of burning and, the last stage, smoke. The work is accompanied by a faulty gearbox thump and rumble. The destruction of even a pair of teeth causes malfunction tool. Extend the term of the life of the rotor can prevent the ingress of dust into the tool, non-admission tool overheat, timely change of the carbon brushes and lubricants, using only the working tools and a diameter, specified by the manufacturer of power tools. 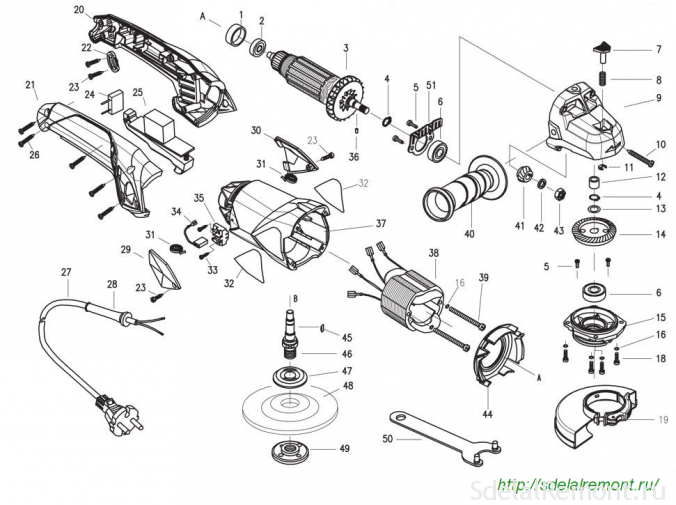 The rotor is a complex assembly, which is in need of repair service centers. But lovers of tinkering with his own hands can repair the rotor alone. Dismantling of the rotor is not particularly difficult. Filmed need to carefully inspect the rotor. If the lamellae rubbed with large grooves, they should be removed, Inst collector lathe. With minor grooves defect is eliminated by grinding. The rotor is clamped in the chuck of an electric and using the Needle and sandpaper removed generation. simple process. Drill is clamped in a vise or securely attached to a flat surface. The drill chuck inserts the end of the rotor, that hosts the lamella, and securely clamped. With the rotor bearings previously removed. The second end of the rotor must be supported set of wooden bars. Drill activated and exhibited a small number of turns. In the first stage, use sandpaper grit large №40..80, at the final stage a smaller №120..200. After sanding is necessary slots are milled between the segments. It is best to perform a hacksaw blade, specially sharpened. After milling collector grooves, edge slats should be clean of burrs, using a diamond needle files. Properly sanded slats should not have burrs. Besides general fault models angle grinders of different manufacturers there are also specific breakdown, characteristic only for the producer of the instrument. But more about that in another article.